I haven't done any reading challenges in a while, whether it be a personal challenge or one from the book club. But because I fell into a reading rut sometime during the last half of 2018, failing to finish any of the books I started reading for the book club discussions, I thought, perhaps, that it's time I challenge myself this year. It's nearly impossible now to make a dent on my TBR shelf, but at least I'd try to read and finish the books I set to read this time around. Enter my amigas in the book club and this bingo challenge I cooked up for us. 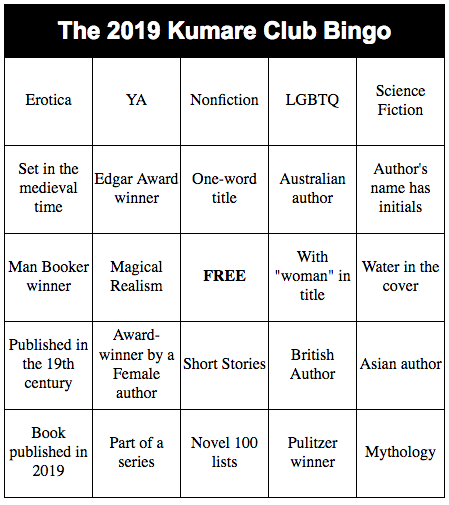 The last time we had a bingo like this in the book club, the four of us had a sort of bet: whoever doesn't make a blackout at the end of the reading challenge will treat the rest to dinner. I achieved a blackout that time, and I intend to enjoy another free dinner again this year. I am done forcing myself trying to finish the books on my bedside table (see post before this one) before the year ends. Quite obviously. It's the last day of 2018 and I haven't moved forward with any of the books I've begun reading sometime during the year. Perhaps they're just not that interesting? 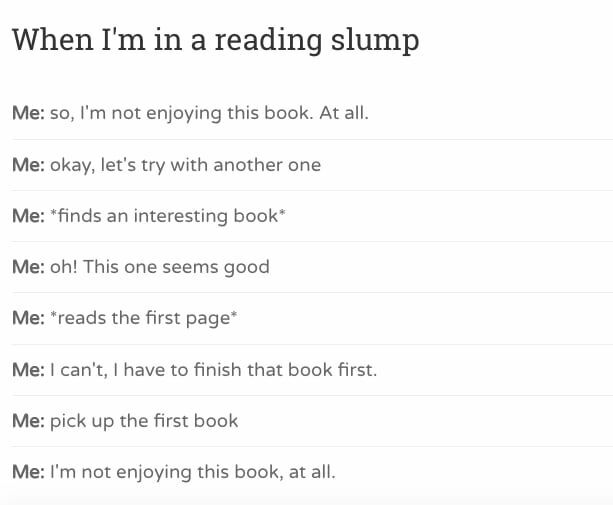 Or I'm now officially in a reading rut? So, in the meantime, I've resolved to put those books on hold until such time I find that I'd like to read them again. Perhaps 2019 will be a new and better reading year for me, yes? Having said that, Happy New Year and enjoy the rest of the holidays, folks! ... *still* reading. Sigh. I seem to be good at picking up and starting books but not finishing them. Here are exhibits A and B.
I started "Eleanor Oliphant is Completely Fine" last September. I can't remember why I picked it up in the first place. I got as far as the first couple of chapters and then October came in, and then I had to pick up a non-fiction title for the book club discussion of the month. Enter "H is for Hawk," which, because it is non-fiction, I failed to finish in time for the discussion. FAIL. Reporting back to work when my maternity leave ended in April meant one of many things: enduring two-hour stretches of traffic going home in the afternoon, and that's not even the worst of it because I try to avoid the rush hour as much as I can. Imagine those two-hour drives extending to three during rush hour... just thinking about it makes me ill already. But because Manila traffic is one of those things that, so far, has no ready or apparent solution (ergo, you just have to grit your teeth and bear it), I decided I had to do something with my sanity -- at least on that part, I have some control over. 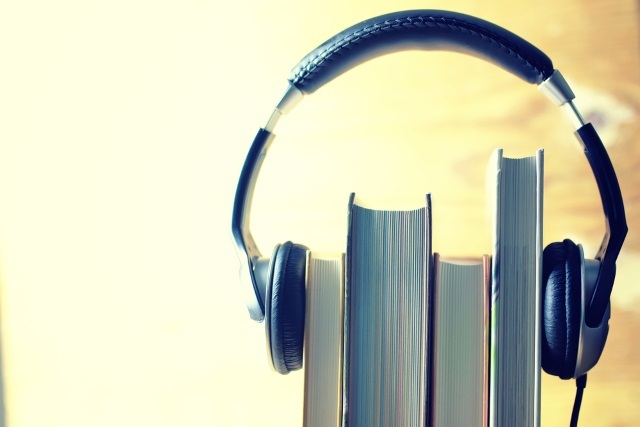 Enter audiobooks. September is historical fiction month over at the book club, and boy am I excited to moderate this discussion! You see, historical fiction is my favorite genre and I'm always amazed at the things I learn reading these novels. Over at the book club, we decided to shake things up a little this year in terms of our monthly reads/picks. For the past 6 years, we've been meeting in person to discuss a specific book; this year, we thought, why not try something new? So instead of a particular book that (most of) our active members have elected to read, we selected 12 genres and from there, the member will get to decide which book he/she will read for a particular reading month. The obvious advantage of this is, of course, the member gets to choose a book (or books) that he/she would really be keen on reading (as opposed to one that was "imposed", yeah?) and that would be more than likely he/she would already have in his/her library. We also get to book-push during the discussion and add more titles to our forever-growing TBR. The downside is that everyone would be completely clueless when someone is talking about his/her book of choice and the focus is really not on the books but on the genre. But anyway, it's just an experiment. We'll assess the result of this experiment at the end of the year and then decide if we want the old format back or stick to the new one. For the first half of the year, these are the genres per month and the books I've picked.